Steel standards are systems for classifying, evaluating, and specifying the chemical, mechanical, and metallurgical properties of different types of steels and ferrous alloys that are used in the production of components, machinery, and constructions. Steel standards are helpful in guiding metallurgical laboratories, manufacturers, and end-users in producing, processing and the application of steel. Heat treatment, such as annealing, quenching and tempering. AISI (American Iron and Steel Institute) steel standards, which are traditionally used in the US and abroad. While this standard is no longer maintained and has increasingly been replaced by SAE, ASTM and other U.S. standards, it is still widespread. EN (Euronorm), which is a harmonized system of metal and steel standards of European countries. Although it is accepted and effectively used in all European countries, “obsolete” national systems, such as German DIN, British BS, French AFNOR and Italian UNI are commonly used and often found in many documents and specifications. 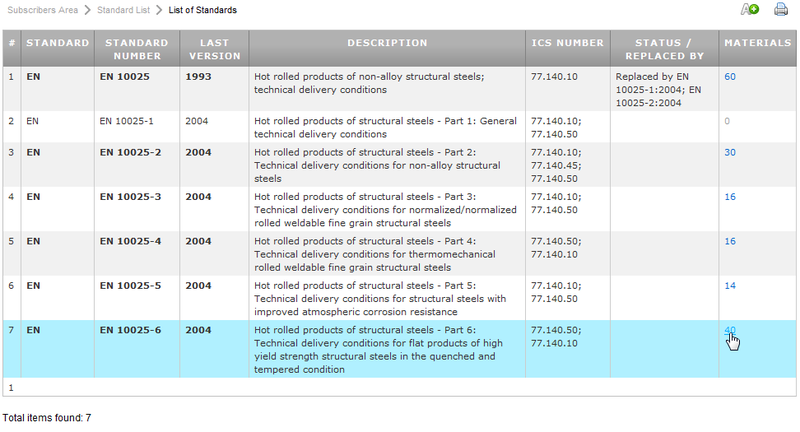 Japanese JIS steel standards, which are widely used in Asia and Pacific regions. JIS steel specifications have also often been used as a base for other national systems, such as Korean, Chinese, and Taiwanese standards. Steel standards of newly industrialized countries, such as Chinese GB and YB, Indian IS, and Brazilian NBR, although sometimes less developed and detailed, are increasingly being used due to global sourcing. The same applies for Russian GOST, which is practically the de facto standard for the whole Community of Independent States. Vertical industrial steel standards include SAE for automotive, aerospace and more; ASME for pressure vessels and many other applications; AWS for welding consumables and related materials. Shipbuilding specifications are covered by the American ABS, British Lloyds, Italian RINA and others. In addition to the many standards described above, many steel manufacturers and suppliers have developed their own proprietary, commercial names for designating steels. Some of these designations have, after years and decades of use, become widely used within the industrial community and are often referred to as “common“ names or “trade” names, without actually referring to the particular supplier. In most cases, these “common” names are not standardized and properties may vary substantially; their application in official technical documents should therefore be avoided. With Total Materia, finding information about a steel standard specification, its current status and the materials it defines is one click away. By simply selecting a Standard Development Organization (SDO) and/or typing the standard number, you receive immediate results from the multi-lingual database with over 52,000 standards. 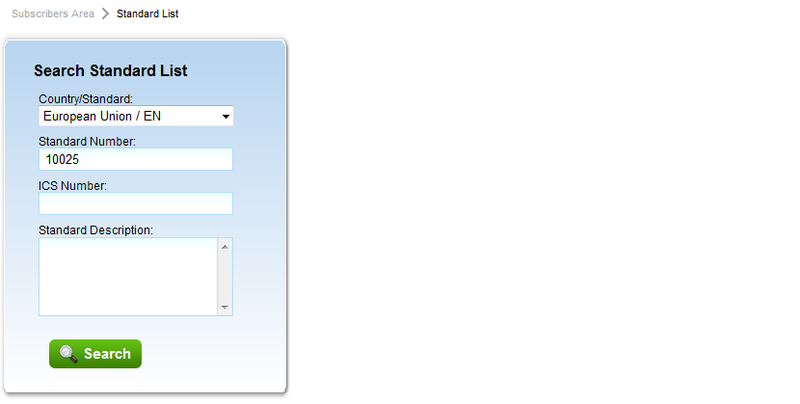 For example, to find Euronorm steel standard 10025, you can simply type 10025 as standard number and select European Union from the popup. 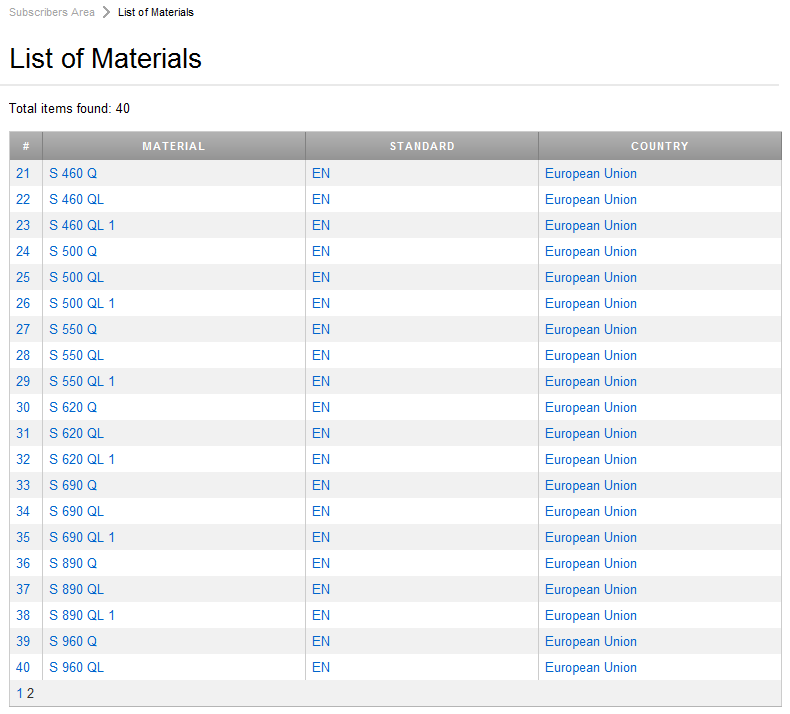 The result list consists of 7 parts of the Euronorm steel standard 10025. Information includes: standard description, year of last issue, current status (valid, replaced etc) and a hot link to the materials defined by this standard. Each of these three parts defines a relatively large list of materials.